It been a tough start for the AVC Woman’s team and but now they are undefeated in conference 2-0 after beating top ranked(#7 SoCal) LA Valley. The AVC team has the talent to be very competitive down the stretch…the key now is consistency. Go Lady Marauders! Kaitilin Stephenson led the Marauders with 18 points and 11 rebounds helping AVC (8-12, 2-0) to its biggest victory of the season as it upset the No. 7 team in Southern California and No. 15 in the state, Wednesday night. AVC’s defense held the Monarchs (14-6, 1-1), which entered the season as the conference favorite, scoreless the final 5:32 of the fourth quarter. "We knew we had to win this game. If we want to make the playoffs, we knew we had to get this one," Stephenson said. "(When we got down), the score never really affected us. We’re learning how to be basketball smart. This game has shown us how much we have improved." AVC’s woman’s basketball team place two players with scholarships. LANCASTER – When Ashley Lipson and Phillisha McFadden both arrived on the campus of Antelope Valley College, neither had a clue who the other was. Two years later, the pair have become fast friends, something that’s evident by their decision to continue their basketball careers at the same college. Lipson and McFadden, both of whom are guards, both recently committed to play at Graceland University in Iowa. McFadden will go on a full-ride scholarship combining athletics and academics, while Lipson’s is a partial ride for athletics. "Philly and I are best friends so it should be pretty fun," Lipson said. "We just click and have a lot in common." McFadden said the two began to talk more and more about joining the Yellowjackets. "We decided we might as well just go to the same school," McFadden said with a laugh. "Ashley and I are close we’re always hanging out. "I’m looking forward to going out there with her." Lipson and McFadden will join another pair of former Marauders at Graceland as Anttanisha Moton and Ashleigh Wilson each just finished up their junior years. AVC women’s basketball coach Barry Green said Graceland has become a viable destination for Marauders looking to continue their playing career. "Anttanisha and Ashleigh had a good experience there and the coach enjoys their work ethic," Green said. "We’ve had a couple players there that have been successful. "I think their coach enjoys the type of players we produce." Lipson, the first in her family to go to college, is known for being a strong shooter behind the arc. Graceland women’s basketball coach Rich Harrop said he’s excited about the potential of Lipson, who averaged 3.5 points per game last season for AVC. "Ashley is a good outside shooter and we look forward to working with her next year," Harrop said in a press release on Graceland’s athletic web site. "Perimeter shooting is an important part of our play in our system and we are anxious to have Ashley compete for a position." Added Green: "I think she can be an effective player coming off the bench in any college system. She can definitely shoot the three and is always going to work hard and help the team win." McFadden, who averaged 4.5 points and two rebounds in her sophomore season, won’t be limited to just one spot on the floor for Graceland. "Philly is a versatile guard," Green said. "She can handle the ball and ran some point for us when we needed her." McFadden, who called her scholarship a major weight off her shoulders, said she still isn’t sure where she’ll be slotted on the court. "It’s still kind of up in the air," McFadden said. "I told them I can shoot and I can dribble." While McFadden has never been to Iowa, Lipson took a visit in early May and was hooked. Even if the chilly weather was a bit of an eye-opener. "I experienced their very cold weather," Lipson said with a laugh. "They have it was the first time it had snowed in May in a long time. "But the school was beautiful." Added McFadden: "It will be a different atmosphere and different weather." McFadden arrived at AVC in the summer of 2010 after taking a year off from basketball after suffering a knee injury as a senior at Pasadena High School in 2009. But the 5-foot-6 McFaddesaid she grew in more ways than one during her time as a Marauder. "I’ve become a better player and also have a better attitude," McFadden said. "I have a better view of the game besides me, myself and I. "Our team really bonded as a family. It’s not all about basketball." Lipson, who said she talked with Moton and Wilson while on her visit, was swayed to Graceland because of its academics. "A lot of the schools I was looking at didn’t have my major," said Lipson, who plans to major in kinesiology and become an athletic trainer. "Everything just came together." But Lipson also admitted that she wouldn’t have had this opportunity without the guidance of Green and AVC assistant DeAnna Butler. "Coach Green and Coach Butler are really great coaches," said the 5-foot-7 Lipson. "They got me mentally prepared to go to the next level." Malika Jackson, 5’11” has signed with Texas A and M International. Malika played all positions including point guard in the past two year at Antelope Valley College. Congratulation Malika! WHITTIER -Sophomore guard Ashleigh Wilson scored 18 points, including four 3-pointers, to lead the Antelope Valley College women’s basketball team to a 59-39 victory over Rio Hondo in its Foothill Conference season opener. Sophomore Malika Jackson added nine points with six rebounds for the Marauders, while freshman forward Whitney Washington finished with six points and 10 rebounds. AVC led 32-23 at halftime, but finally played up to its potential in the second half, according to coach Barry Green. The Marauders gave up a total of 19 offensive rebounds to a much small Rio Hondo opponent. "We just started off kind of flat, kind of going through the motions," Green said. "It was a team we should beat, but you can’t overlook teams and not execute. We did that in the first half." The Marauders are ranked No. 14 in the Southern California rankings this week. Green believes they’re now able to ease into a routine now that conference play has started and they’ll only be playing two games a week, despite winning two tournaments in non-conference play. "For us, it’s better to play one game, get our legs back and prepare for the next one," Green said. "Back-to-back games in tournaments are tough for us because we’re not deep at point guard and at the wing positions." AVC (11-5, 1-0) hosts Cerro Coso on Saturday at 1 p.m.
Was all that running you did this summer worth it? 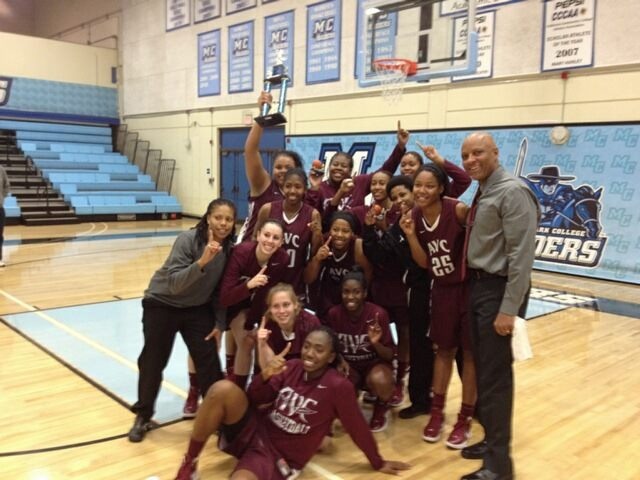 After a rough start, the AVC woman’s team has won 8 of its last 9 games and won its second straight tournament. The AVC’s women’s team is peaking for its conference season. EL CAJON -Sophomore Malika Jackson sank two clutch free throws with just seconds left to lift the Antelope Valley College women’s basketball team to a 52-50 victory over Citrus in the Grossmont Tournament championship game Friday evening. A Citrus player was fouled with 7.7 seconds remaining with the score tied 50-50, but missed two free throws before Jackson converted hers at the other end. AVC led 26-14 at halftime after racing out to a 16-0 advantage to begin the game, but trailed by as many as three points in the second half as Citrus made its run. "It went back and forth, but we were able to manage the adversity of the game," AVC coach Barry Green said. "We were able to get some quality shots down the stretch and found a way to pull it out." Jackson had 15 points with eight rebounds and sophomore center Maurisha McKissic finished with 15 points and 13 rebounds to lead the Marauders, while sophomore guard Ashleigh Wilson finished with nine points and six assists. McKissic was selected as the tournament’s MVP, and Jackson was named to the all-tournament team. The Marauders have now won eight of their last nine games, including two tournaments, and look to continue their surge in Foothill Conference play beginning Wednesday at Rio Hondo beginning at 5 p.m.
"We have some good momentum going into conference," Green said. "They’re feeling confident that they can keep up with the better teams in the state."